Bruks Tree Surgery is a unique family run business with a military-backbone; offering great service since its creation in 2008 after Bruk completed 23 years of service in the British Army. Based in Thanet and Canterbury, BTS covers every aspect of Tree Work and Garden Maintenance throughout the Kent region, employing many ex-military staff to maintain both precision and manners within an industry not often renowned for either! BTS is very proud to work with The Prince’s Trust and with several local Primary & Secondary schools in order to offer relevant key skills and experience to many young people interested in the Arboricultural and Creative Wood Industries. BTS cover Dover, Deal, Sandwich, Canterbury, Faversham, Whitstable, Herne Bay, Medway & Thanet. Your needs for a Tree Surgeon or for Garden Maintenance might only involve pruning small trees and shrubs or reducing height and side growth from your hedge or you may simply need a stump removed. It may be more substantial, where the complete dismantle of a large or dangerous tree close to your home is required or a full ground site-clearance job may need to be carried out for new building work to take place. BTS can happily accommodate all of these varied work requirements. Bruks Tree Surgery can meet all of your requirements using a variety of techniques to adapt to the landscape and we endeavour to climb the trees in question using either ropes & harnesses or hooks & straps, rather than cranes and lifts. We understand the varied Kent environment and the need to often work close to animals as well as in close proximity to homes or office buildings. 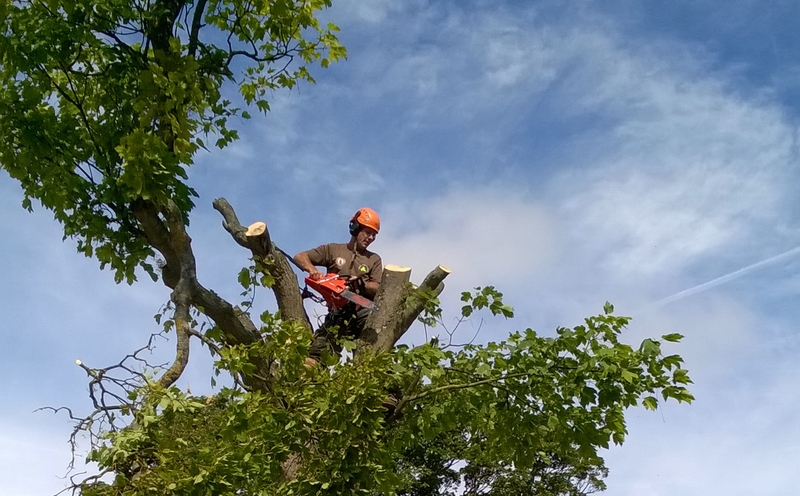 Bruks Tree Surgeons pride themselves on the vast choice of equipment available to use for each individual job, from large Chainsaws and Stump Grinders to the humble petrol mower and secateurs. BTS has also carried out extensive contract work for track-side clearance on the railway lines, sponsored by Avondale Environmental Services Ltd and as such, (with a Link-up / Risk approved Sponsor) we are also able to offer a BTS crew Fully PTS trained, experienced and ready to go. The BTS crew are all fully-qualified and experienced in their Tree, Ground and Aerial Rescue roles for all domestic and commercial work and each crew member holds a Level 2 Emergency at Work First Aid qualification. BTS hold the coveted Checkatrade Membership, which we hope will give all of our customers the peace of mind they need when requesting our services. BTS are Street-Works accredited and can, therefore, work on jobs which require Traffic Management. In short, we love what we do – we know what we are doing and we understand how to do it all safely! Bruks Tree Carving adds another dimension to Bruks Tree Surgery, as you might prefer to leave the stump in your garden exactly where it is and have Bruks Tree Carving create a little magic out of it! If you would like to see one of Bruk’s African themed Carvings, then you will find one of a traditionally clothed African pregnant lady displayed in the Powell-Cotton Museum & Gardens situated in Quex Park, Birchington. We are; most importantly, fully qualified, fully insured and completely reliable. The majority of the BTS crew are from a military background where precision, dependability and courtesy form the backbone of our service. All tree surgeon operations are carried out to the relevant British Standard BS3998: 1989; all work is undertaken to within the current Health and Safety Executive recommendations; AFAG (Arboriculture & Forestry Advisory Group) directives and to Arboricultural Association guidelines and directives currently in use. Bruks Tree Surgery has carried out several jobs for our company including multiple stump removals, the work was carried out in an efficient and timely manner without causing disruption to our customers. I would not hesitate in recommending their services. 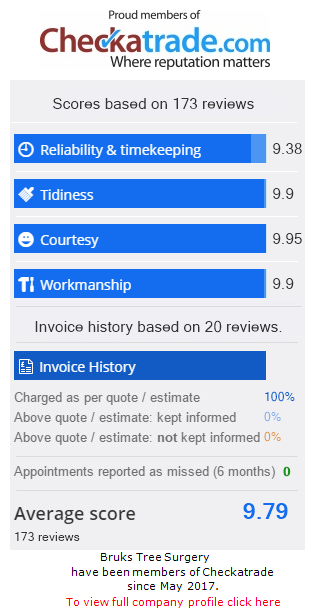 Just wanted to say many thanks for an impeccable job – you should be very proud of the service you provide. Please thank the guys for the job they did – I couldn’t be more happy with it! The job was carried out swiftly, efficiently and safely, without disruption to our own operations. We would recommend them without hesitation. Rebecca & Bruk, thank you for your assistance on this project, we found it very easy to consider you a partner because of your professional approach and valued input. Your teams were very knowledgeable and a credit to your business providing both expert knowledge and advice on site. We look forward to working with you again. Bruks Tree Surgery is a family run business which has been offering great service since its creation in 2008. Based in Thanet and Canterbury, BTS covers every aspect of Tree Work and Garden Maintenance throughout the Kent region.Our Primary Coverage areas are Dover, Deal, Sandwich, Canterbury, Faversham, Whitstable, Herne Bay and Thanet.